Albert's squirrels are 46–58 cm long with a tail of 19–25 cm. The most noticeable characteristic would be their hair ear tufts, which extend up from each ear 2–3 cm. They typically have a gray coat with a white underbelly and a very noticeable rusty/reddish colored strip down their back. The Abert's squirrel typically builds its nest in the branches of the ponderosa pine in groups of twigs infected with dwarf mistletoe. 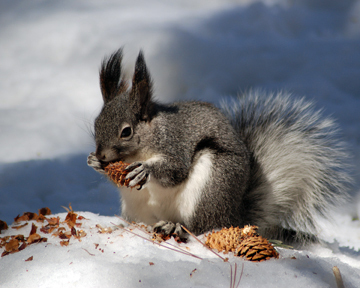 The Abert's squirrel does not store its food like other North American squirrels. Red squirrels can be easily identified from other North American tree squirrels by their smaller size, territorial behavior and reddish fur with a white venter (under-belly). 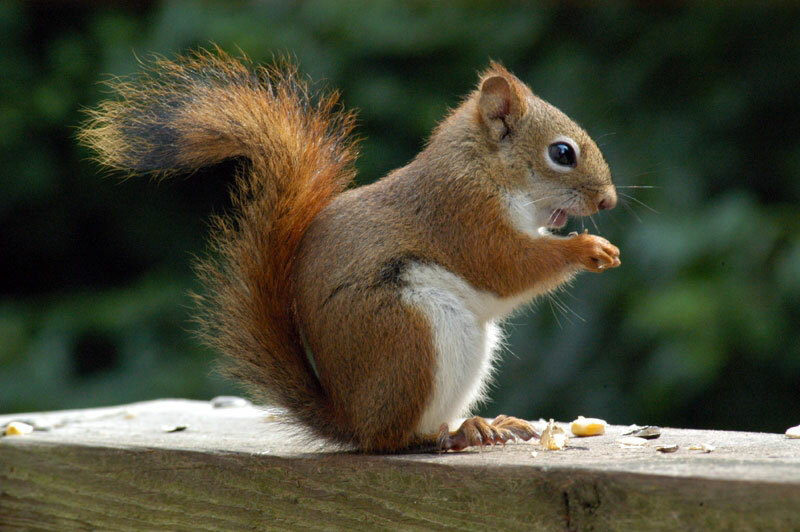 Red squirrels are also somewhat larger than chipmunks. The eastern gray squirrel, or grey squirrel (depending on region), (Sciurus carolinensis), is a tree squirrel native to the eastern and midwestern United States, and to the southerly portions of the eastern provinces of Canada. 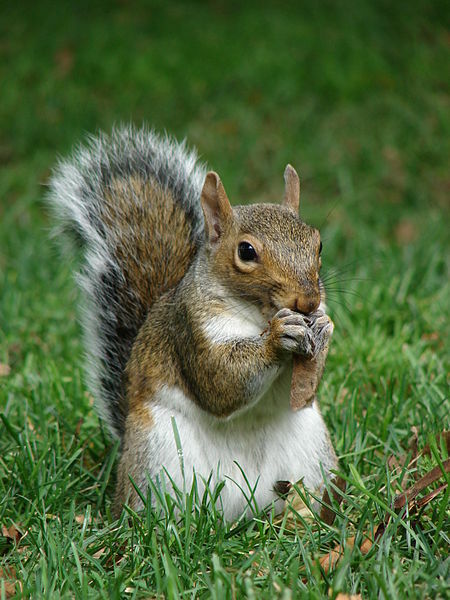 The native range of the eastern gray squirrel overlaps with that of the fox squirrel with which it is sometimes confused, although the core of the fox squirrel's range is slightly more to the west. As the name suggests, the eastern gray squirrel has predominantly gray fur but it can have a reddish color. It has a white underside and a large bushy tail. 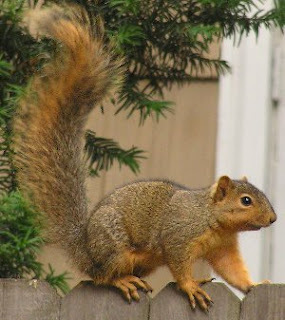 ﻿﻿﻿﻿The fox squirrel (or eastern fox squirrel, Bryant's fox squirrel, Delmarva fox squirrel) (Sciurus niger) is the largest species of tree squirrel native to North America. They are also sometimes referred to as the stump-eared squirrel, raccoon squirrel, or monkey-faced squirrel. Despite the differences in size and coloration, they are sometimes mistaken for American Red Squirrels or Eastern Gray Squirrels in areas where both species co-exist. While very versatile in their habitat choices, fox squirrels are most often found in forest patches of 40 hectares or less with an open understory, or in urban neighborhoods with trees. They thrive best among trees such as oak, hickory, walnut and pine that produce winter-storable foods like nuts. Shown above are just a few of the many types of squirrels that can be found in the Western portions of the United States. A small calibre rifle, such a .22 cal, is the best way to harvest squirrels. But, when in a survival situation you may not have such luxuries. A squirrel pole trap can be made to catch squirrels. Several of these pole traps can be placed in areas where there is active squirrel signs or sightings. Refer to the diagrams below to see how a squirrel pole is made. The loops for the snare should be approximately three fingers in diameter. The wire length should be approximately 4 inches long after being tied off to the pole. This is to allow the squirrel to dangle far enough away from the pole when it falls so that it can not reach the pole with it's feet. If is able to reach the pole, the squirrel can actually chew through the wire and escape. The loops should be placed at different intervals around the pole. One pole can actually catch more than one squirrel. The poles should be placed at a angle propped up against a tree that shows signs of squirrel usage. Squirrels are prone to take the easiest path up a tree, which would be the pole trap. Traps should be checked at regular intervals so as not to leave a dead squirrel for to long of a period making it useless as food. Cleaning a squirrel after you have trapped or shot it is a very simple process. Prior to cleaning any animal, ensure that you have any open cuts on your hands covered so that you don't get an infection of some type. First thing to do is to cut the feet off at the first joint from the toes upward toward the body. Then remove the head. Next, cut around the mid section of the hide around the diameter of the body as shown in the diagram. Place two fingers under each side of the cut and pull the hide outward toward both ends of the body. This should remove the outer hide like pull off a glove. Next, cut down the center of the belly side from groin to neck. Remove the innards. You can eat the heart and liver. Ensure the liver has a smooth wet deep red appearance. Any other color may mean the animal is diseased and should be used as bait for larger prey or discarded. Next, wash the carcass if water is available. When eating meat in a survival situation, it is important that you have water to help digest the meal. You can then cut the meat into large chunks to make a soup or stew or you can cook it over an open fire like a shishkabob. It takes about three squirrels to make a full meal with addition to whatever plant food you can find. It's not squirrel season in my neck of the woods, but when it opens I will attempt to make a video on how to clean and cook a squirrel.